Lately, there has been vocal condemnation against Canada Goose for its fur-trimmed coats. Even Bill Maher went after them on Real Time, graphically describing the horrors imposed on coyotes and geese whose fur and feathers are used in their coats. Of course, we agree that what is done to these animals for clothing is truly horrific, unnecessary and inexcusable. If what is pictured upsets you, then good, it upsets us too. 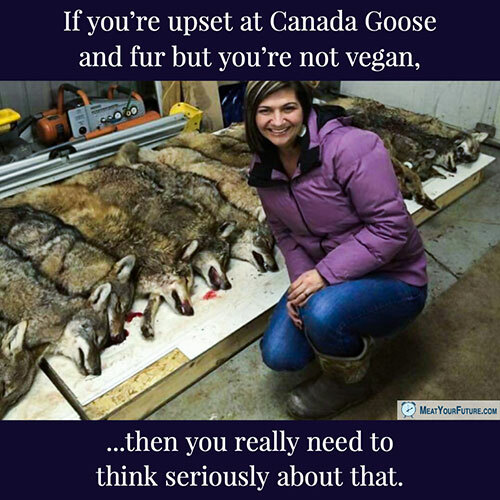 However, if Canada Goose upsets you, but you are still otherwise using and consuming animal products, then we urge you to really think about that. When we buy and consume animal products (whether fur, eggs, leather, wool, dairy, meat, poultry, fish, or otherwise), we are directly paying for and supporting horrific cruelty, suffering and death imposed on countless billions of vulnerable animals. And, just like the fur used for Canada Goose’s jackets, it is *all* unnecessary. The underlying problem is not Canada Goose (or any other particular company). The fundamental problem is that we, as a society, continue to view other animals as our “resources” to exploit for unnecessary and trivial purposes. It’s hard to see how there will ever be any meaningful improvement in how we treat animals (whether coyotes or otherwise) unless and until we deal with this underlying and speciesist mindset. We have no biological need to consume any animal foods for our health, and we certainly have no need to use animals for fashion, entertainment or any other such trivial purpose. So, if you believe it’s wrong to impose unnecessary and easily avoidable harm and death on animals like these coyotes, then please be consistent and extend your moral concern to *all* animals by living vegan.